On 13th July 2016, We visited CLASS Sanothimi for kit distribution. At the same time we did program, activities for children and parents meeting.25 Parents and 4 teachers are involved in the program. We managed activities for children. We discussed with parents about children education and their personal hygiene. There are studying 25 CLASS program and 3 RSS supported children. 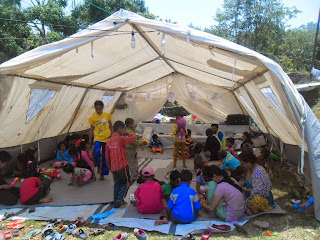 Most of the children's family used to stayed in Manohara river bank (slum area).